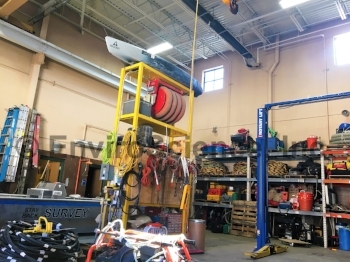 The ES-Dive team includes engineers, dually registered Professional Engineer divers, and M.S.C.E.s with specialties in Hydraulic and Geotechnical Engineering. ES-Divers has been conducting underwater inspections since 1998 and is qualified in underwater imaging and modeling via side scan sonar and scanning sonar. Sonar (Sound Navigation and Ranging) is a technology that utilizes sound waves to view underwater environments. Side scan sonar, usually mounted to or towed behind the boat, scans the river bottom. Scanning sonar remains stationary underwater and can scan 360 degrees. This technology is rapidly growing and developing – completely changing the way submerged settings are viewed and studied. With this technology, it is now possible to inspect submerged structures that were previously impossible due to hazardous or murky conditions. Bridge inspections, scour volume calculations, substrate mapping, survey-grade depth surveys, object location, search and recovery, diver safety, and more can be done efficiently and effectively. ES-Divers has several capable divers trained in sonar deployment and operations. Additionally, ES-Divers GIS analyst Rachael Goliver received in-depth training on the science behind acoustics and sonar technology, how to deploy and repair sonar hardware, and how to best process sonar imagery with multiple software packages. She has also been trained in the field for hands on experience with the Mesotech 1000 Scanning Sonar, Starfish 450F, and Dual Axis Scanning Sonar. ES-Divers recently used this technology to inspect bridge piers for Tennessee Department of Transportation. ES-Divers has a fleet of boats capable of performing in-shore and near-shore work across the country. ES-Divers perform underwater inspection, Non-destructive Testing, and Ultrasound Testing. ES-Divers has provided ongoing bulkhead services to Geis Companies. 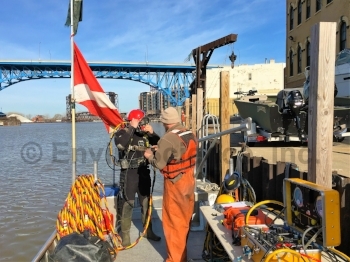 ES-Divers recently (2016) performed underwater non-destructive evaluation of 1500 LF of steel sheet pile bulkhead along the Cuyahoga River. We completed comprehensive 100% Level I and 10% Level II underwater inspection of the entire length of the bulkhead. 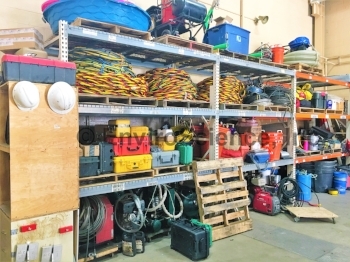 These Levels of inspection are based on the American Society of Civil Engineers (ASCE) Underwater Investigations Standard Practice Manual, 2001, United States Naval Engineering Command (NAVFAC), and the Federal Highway Administration (FHWA). During the Level II inspections, the surface area was cleaned of marine growth at the waterline, mid-level, and at the streambed, and a hand held multiple echo ultrasonic thickness gauge was utilized to measure the remaining cross section of the steel sheet piling (Level III). We recorded water depth soundings along the length of structures and provide more detailed soundings if scour is discovered. Underwater digital photography was used to document conditions. In addition to making sure our divers are well-trained, ES-Divers also invests in state-of-the-art technology and equipment to make sure our divers are safe and projects are completely efficiently. EnviroScience, Inc. (ES-Divers) performed underwater bridge inspections for the Tennessee Department of Transportation (TDOT), as a subconsultant to Palmer Engineering, following Federal Highway Administration (FHWA), Occupational Safety and Health Administration (OSHA), US Coast Guard (USCG), and TDOT regulations. 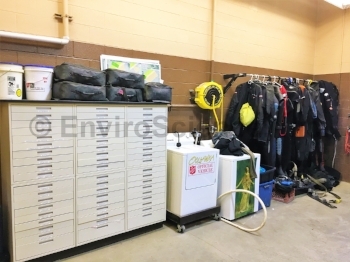 ES-Divers was responsible for providing all necessary dive equipment and personnel to complete the underwater inspections. Water conditions consisted of zero visibility, swift current and heavy debris. ES-Diver’s dive plan and method of operations was determined to maintain safety, communication, and efficiency for the inspection team. ES-Divers mobilized commercial dive teams with state-of-the-art surface-supplied-air (SSA) equipment, diving vessels, sounding equipment, and Sector Scan Sonar hardware and software to capture detailed underwater images. Our surface supplied air diving operations enabled the diver to be in constant communication with the surface support team throughout the entire inspection. 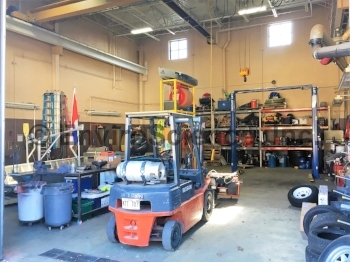 All equipment and staff necessary to successfully complete the inspection was assessed prior to the inspection. Daily dive logs, hazard analysis, and safety briefing reviews were conducted prior to every dive. Our diving inspection teams are continually updated and trained in the changing environments and approaches related to the underwater inspection services offered. Upon completion, all field notes and applicable sketches were verified against previously noted conditions. 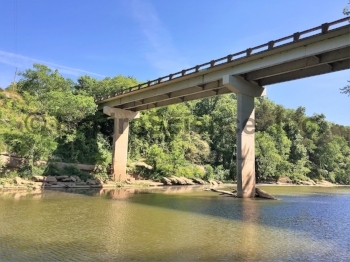 A report including notes, sketches, sounding data, pictures and recommendations was compiled for each of the inspected bridges. Underwater acoustic images of the substructure and surrounding streambed were acquired for bridges with water depths that exceed 33 feet. Our GIS specialist created a mosaic using images gathered in the field using a state-of-the art sector scan sonar head and software coupled with HD photographs.